One or perhaps 2 species distributed throughout the temperate parts of the northern hemisphere; the European and Asia plant is Andromeda polifolia*. North American plants are sometimes treated as a separate species, Andromeda glaucophylla, although the differences between the American plants and those from Eurasian populations are minor ones. Very like A. polifolia, but with longer leaves which are white and densely hairy underneath. Dwarf, evergreen shrubs requiring acid soil. 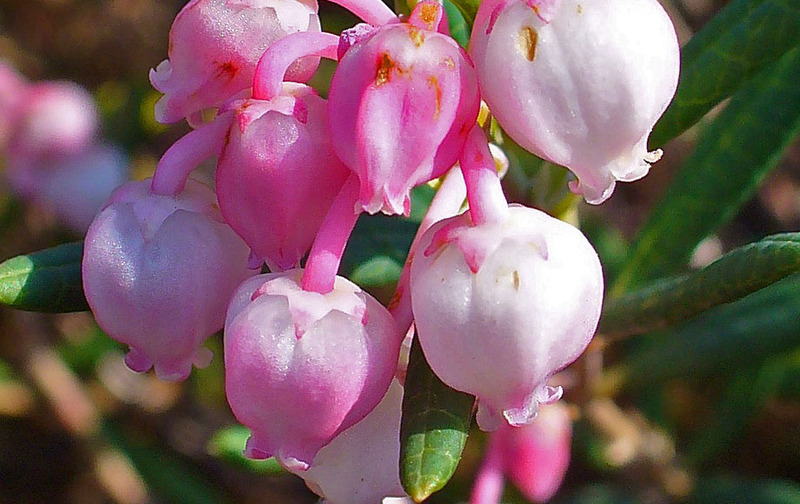 They have elliptic leathery leaves and small, urn-shaped pink or white flowers in late spring and early summer. Suitable for USDA hardiness zone 2. Andromeda was named by Carl Linnaeus: see E. C. Nelson 2007. Carl Linnaeus: a tercentenary celebration. Heathers 4: 1–3. polifolia refers to the foliage of a plant called 'Polium', and does not signify numerous leaves: see E. C. Nelson and P. H. Oswald, 2005. Polifolia revisited and explained. Huntia 12 (1): 5–11.